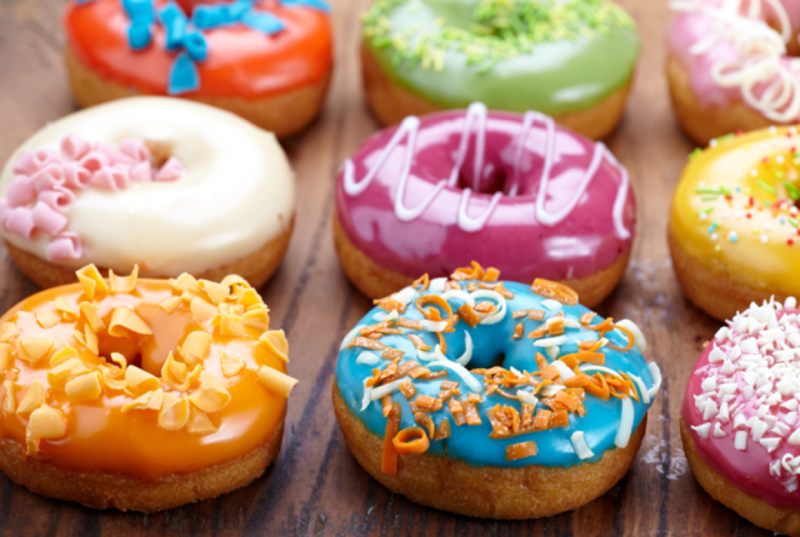 Here are 10 fascinating facts and anecdotes that I bet you never knew about doughnuts! 1. The doughnut as we know it today, supposedly came to Manhattan under the Dutch name of olykoeks, meaning oily cakes. 2. They may have been created by mistake! One story reportedly tells of a cow who kicked over a pot of oil into a mixture of pastry. 3. In the Middle of World War I, millions of homesick American soldiers were served up countless doughnuts by ‘Doughnut Girls’ women volunteers, trying to give the soldiers a taste of home. 4. During World War II, Red Cross women otherwise known as Doughnut Dollies passed out hot doughnuts to the soldiers. 5. The first doughnut machine was invented in New York during 1920 by a man named Adolph Levitt, a refugee from Czarist Russia. Levitt’s doughnut machine was a huge hit causing doughnuts to spread like wildfire. 6. To ‘dunk your doughnut‘ was allegedly introduced as a trend after actress Mae Murray accidentally dropped one in her coffee. 7. The largest doughnut ever made was an American-style jelly doughnut. It weighed 1.7 tons, was 16ft wide and 16inches high. It was made in Utica, New York, USA on January 21, 1993. 8. If all the doughnuts sold during 20 years of National Doughnut Week were stacked on top of each other, they would reach into space. Now I guess we know what astronauts snack on! 9. The record for doughnut eating is held by John Haight, who ate 29 doughnuts in just over six minutes in 1981. Mmmmm! 10. Two fundraisers from The Children’s Trust attempted to break the world record for doughnut eating at The Sun online in 2007! Well done guys!